Teen Staying Up Too Late: Julian is off to a great start for his Jr. year it’s hard not to be too busy with all of the extra-curricular activities after school. He’s a procrastinator so it makes for late nights! Suggestions? Effectiveness of Private Tutoring vs. Online Classes: Our daughter is very bright and has a high GPA. However, she also has issues with test anxiety and worry, because of her self imposed high standards. She has labeled herself a “bad standardized test taker” and I feel her one obstacle is the SAT/ACT test because of her anxiety and slower processing time. How do we know when private tutoring will be better than a class or online program for the SAT? 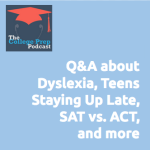 Dyslexia and College Admissions Prospects: Our daughter struggles with dyslexia. She currently goes to our local high school, but I was thinking about moving her to a private high school that specializes in helping students with learning disabilities. We want to know if colleges view this private high school as a lesser school and if that would limited her choices. ACT vs. SAT Tests and Scholarship Opportunities: My daughter is a senior and filling out college applications. Should she retake the SAT if we know that she did better on the ACT and likes the test layout better. For college scholarship purposes, does she need a “better” SAT score? Also, Some schools deadlines are Nov. 1. If the applications are completed well before then (like next couple weeks), will they still accept her test scores “after” the deadline, if she chooses to take it later again and they won’t have her score by Nov. 1? Student Who Doesn’t Want to Go to College: I am a parent of a brilliant but unorganized middle schooler. What can a parent do if their child is expressing that they do not want to go to college? Tune in to hear Megan and Gretchen muse on these questions, proposing a number of strategies and resources. For more information about how to tackle procrastination in teens, tune in to this podcast episode or watch Gretchen Wegner’s free webinar on the topic. To enroll in one of Megan’s online ACT/SAT testing programs or discuss the possibility of private tutoring, visit her website. 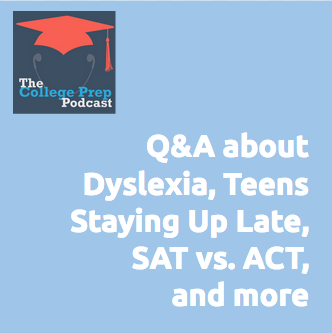 259: Is Getting Into the “Right College” Worth All the High School Stress? © 2014 by The College Prep Podcast	/ Proudly powered by WordPress	/ Theme: thebox by design news.